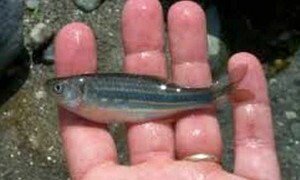 Tag Archive | "Giant Danio"
The Giant Danio (Devario aequipinnatus) is shoaling fish that is native to the clear, moderately flowing, gravel streams and rivers of Sri Lanka, Nepal, and the West coast of India. 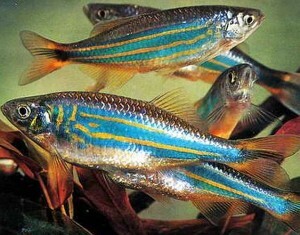 They are an active fish that thrive in the hilly streams at elevations up to 1000 feet above sea level. Giant Danios have torpedo shaped bodies that are a captivating blue to blue green in color. They have yellow to gold colored horizontal lines and spots that intensify the body color, and fins that are a gray to clear color. Giant Danios, as their name implies, grow to an impressive length of 4 inches in the wild and make great candidates for larger community tanks. Because Giant Danios are fast swimmers, they should be housed in a long tank in groups of at least 8 to 10 fish. They should be housed in a large densely planted tank with a smaller sized gravel substrate, some driftwood branches, a few river rocks and plenty of swimming area. A power head or two should be placed in the tank to provide the necessary water movement and a good filter is necessary to maintain the clean water conditions they thrive in. Weekly to bi-weekly 20% to 40% water changes will keep these Danios healthy, and because these fish are active jumpers, a tight fitting aquarium cover is a must. Giant Danios are egg scatterers that are stimulated to spawn by sunlight. The female will scatter up to 300 eggs which are immediately fertilized by the male. Hatching occurs within 36 hours and when free swimming, the fry should be fed fine pieces of live foods. 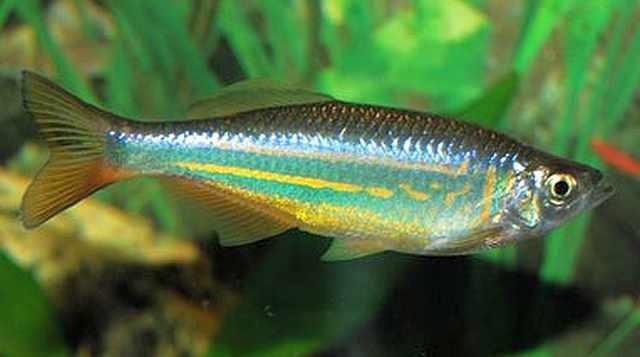 In their natural environment, Giant Danios feed on exogenous insects, small crustaceans and worms. In an aquarium environment, they should be fed a diet of flake food with plenty of vegetable matter augmented with live, frozen or freeze dried bloodworms and tubifex . Devario aequipinnatus are commonly available and are sold when they reach 1 1/2″ to 2″ in size.